The short life cycles of our beloved gadgets is something of a double-edged sword. From one aspect, it means that we're essentially always chasing; no sooner does a device roll out than we switch attention to what's next. This conveyor belt of new releases also works in our favor, though, since rapid ageing of gadgets amounts to sharp price reductions. This time last year, Asus rolled out the ZenWatch 2 and thus, the company's original wearable shaved a sizeable chunk off its price. Now, with the ZenWatch 3 being the latest and greatest, the ZenWatch 2 gets to enjoy a similarly heavy discount. It's fair to say that despite some initial hype, wrist-worn computers have gotten off to a stuttering start. There's plenty of variety for consumers to choose from, but most of the market's current crop seem to suffer with similar drawbacks. Limited functionality, not-yet-matured software and high prices have yet to convince many within tech community. But the big names continue to plug away, and the Asus ZenWatch 3 -- as seen in our hands-on coverage -- is a real eye-opener of a smartwatch. 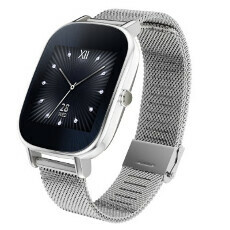 Asus ZenWatch 2 is now down to $129.99, a neat $70 off the usual price. It's quite a bit more geeky than its successor, sporting a round-cornered square finish that many smartwatch OEMs -- including Asus -- seem to be departing from in favor of circular faces. You get a 1.45 or 1.63-inch AMOLED display dependent on your chosen size configuration, and both are 2.5D panels toughened by Corning Gorilla Glass 3. It also gets a Snapdragon 400 chip with 512 MB of RAM, which capably runs Android Wear without much fanfare. As noted in the title, this particular deal relates to the variant with the metal Milanese Loop band. It's also specific to the smaller 1.45-inch display. If you absolutely need the larger variant, the 1.63-inch Rose Gold version with the Taupe Leather band is down to $158.79. If you'd like to grab the ZenWatch 2 at its cheap price, please check the source link below. It's a great deal for an Android Wear smart watch with a speaker. No heart rate monitor or GPS. But it still has all the basic sensors like accelerometer, gyroscope, compass, mic, and speaker. The larger one has a 320x320 display, where as the smaller version only has a 280x280 display.